Here at English Blinds we have put together a fabulous collection of luxury made to measure blue roman blinds in a beautiful range of elegant shades. With hues of navy, sapphire, sky, pastel, royal, denim and azure to choose from, finding the perfect blue to compliment your room’s colour scheme has never been easier. 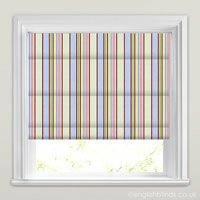 They are the ideal way to bring soothing tones and a truly sumptuous look to your windows. Choose from colourful printed and patterned designs, stripes, dots, classical scenes and of course luxurious floral embroidered fabrics. 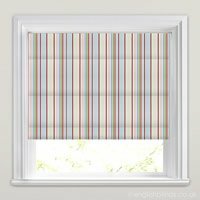 All English Blinds roman blinds are hand finished to the highest standard, fully lined with a no cost blackout lining option and are available to buy online with a deluxe chain operated headrail. Great for creating a nautical or coastal look at a bathroom, kitchen or dining room window, our designer blue roman blinds are full of rich colour and gorgeous designs. From traditional to contemporary, whatever the style of your interior décor we have a style that will enrich and enhance all types of room settings. Great, high quality product. Fast delivery. 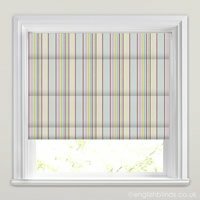 I am really pleased with this made to measure blind, it looks stunning in my bathroom and it was very easy to put up. Delivery was on time too.